I did manage to crank out two layouts. I am happy with the way they turned out. I will have to wait until tomorrow to get a pic of one of them though. 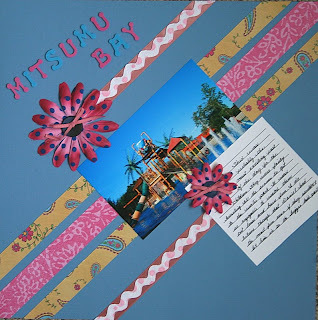 This one is of Mitsumu Bay, the wet play area at the African Lion Safari. I can't believe that I only got a photo of the older children's area and not one of the area for the smaller children.. duh!!! It was quite the task, we had three children in the one area and one in the other.. so we kept switching running between them. Personally I think Daniel would have been fine in with his brothers and sister but they wouldn't let him in, so he had to play by himself. Not like he wasn't quite happy to do so. LOL I saw a layout like this in the Canadian Scrapper and knew right away that I had to try it. Now I am heading back to bed with my cup of hot Orange Spice Tea.